"Holly Black’s Cassel, from White Cat. I’m really worried about that kid. I think about him all the time. For me, that book is the gold standard of prose and character development, and that character is a real person. I want to fix his whole life and I know I never will." - Margaret Stohl, co-author of Beautiful Creatures. "Cathy from Wuthering Heights. I love characters who justifies their horrible behavior. They are so interesting to me." - Swati Avashti, author of Split. "Many, many characters have inspired me; I'd have to say that I'm particularly impressed by those in a lot of anime series. Such as L and Light from Death Note, who out-connive each other in spectacular ways, or Yukino Miyazawa from Kare Kano (His and Her Circumstances), whose perfect student exterior hides her all-consuming desire to be praised and admired." - Karen Kincy, author of Other. "It's always someone different, depending on what I'm working on. Right now, some characters who inspire me are Jace Wayland, Atticus Finch, and Amélie." - Brenna Yovanoff, author of The Replacement. "Gwyn from Cynthia Voigt’s novel Jackaroo. I read this book in middle school and it sparked my desire to tell stories—and also made me feel very empowered as a girl." - Bree Despain, author of The Dark Divine. "John Connor from The Terminator series. He is a fascinating character, even in the fourth film (I pretend the third film never happened). He’s like a grittier Harry Potter in that he has this enormous destiny everyone expects him to live up to—surviving the end of the world to lead humanity out of darkness and extermination. That is QUITE the weight on a child’s shoulders, and it’s fascinating how he handles this and grows up and is still able to function and pull it all off. He’s just a great character." - Courtney Allison Moulton, author of Angelfire. "Wow. That’s a tough one. I think it’s in general, the anti-hero. The character who is hard to like. My first one of those I read who has stuck with me over the years is Elric of Melnibone (Michael Moorcock). I remember liking him, yet knowing he wasn’t nice. I think he’s inspired me over the years to create flawed characters who I find interesting and likeable despite those flaws." - Diana Pharaoh Francis, author of Bitter Night. "All the boys on the TV series Friday Night Lights, especially Jason Street and Matt Saracen. They each have their individual stories and struggles, which are so moving! Love that show!" - Mindi Scott, author of Freefall. "I'm inspired by any character who is strong, forthright, true to herself, and follows her dreams. Growing up, I loved reading about characters who were also writers, like Jo March or Anne Shirley." - Diana Peterfreund, author of Rampant. "Amelia Peabody, in the series written by Elizabeth Peters. She is so strong and smart and confident. She can do anything she puts her mind to." - Anastasia Hopcus, author of Shadow Hills. "Clinton Tyree, aka Skink, the swamp-living, shower-cap wearing ex-governor in many of Carl Hiaasen’s novels. He’s insane, yes, but he’s also a fearless defender of wildlife and a fervent activist, even if his methods are a bit…unorthodox. Love him so much." - Michelle Hodkin, author of The Unbecoming of Mara Dyer. "Oh, so many! Meg in A Wrinkle in Time, Katniss in Hunger Games, Leslie in Bridge to Terabithia. You can see I have an affinity for strong, creative, smart girl characters." - Kristin Tubb, author of Selling Hope. Come back Thursday to find out what fictional characters inspire the rest of our authors! Thanks to the incredible generosity of the authors I was able to pull together another epic giveaway for this round of Author Insight, so thank you to all those who donated books and swag. Let's see those prizes! Now, listen closely, because I'm about to tell you how this is going to work. There will be FOUR winners. My only request is that winners who get early picks on the books don't take all the signed books. You can. It is your pick afterall, but at least consider sharing the wealth. That's all I ask. 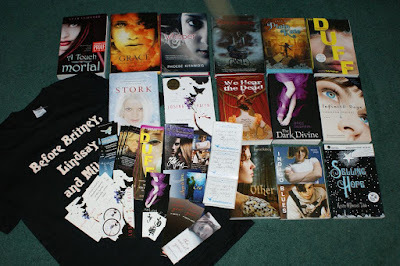 Grand Prize Winner - Choice of 5 books from the photo above, a book of your choice from Diana Pharaoh Francis that she will sign, the We Hear the Dead T-shirt, and assorted swag. . Winner #2 - Choice of 4 books, a book of your choice from Diana Pharaoh Francis that she will sign, and assorted swag. Winner #3 - Choice of 3 books and assorted swag. Winner #4 - The remaining two books and assorted swag. Love these answers! I, too, am inspired by characters like Atticus Finch, Cathy from Wuthering Heights, and Katniss Everdeen. My most inspirational characters come from Markus Zusak's The Book Thief. Papa, Liesel, Rudy, Max, even Mama. These realistic characters make me perk up and listen. Thanks for the *inspirational* topic and for the giveaway! Very interesting to see which characters inspire which authors! Yay Brenna! She went with Jace Wayland. How could you not adore him! Wow, what great secrets and books! I love this feature! And thanks for the great giveaway! Oh-My-Goodness! This is one heck of a giveaway! And what a great idea to post on your blog. So neat to see what author's think about different characters. Wow what an awesome contest! !